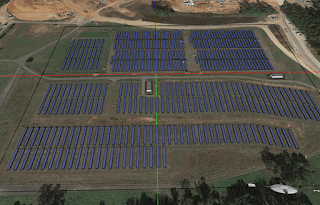 SAS, a software company based in Cary, NC, is powered by a solar farm consisting of solar panel arrays driven by horizontal single-axis trackers (HSAT) with the axis fixed in the north-south direction and the panels rotating from east to west to follow the sun during the day. Figure 1 shows an Energy3D model of the solar farm. Xan Gregg, JMP Director of Research and Development at SAS, posted some production data from the solar farm that seem so counter-intuitive that he called it a "solar array surprise" (which happens to also acronym to SAS, by the way). The data are surprising because they show that the outputs of solar panels driven by HSAT actually dip a bit at noon when the intensity of solar radiation reaches the highest of the day, as shown in Figure 2. The dip is much more pronounced in the winter than in the summer, according to Mr. Gregg (he only posted the data for April, though, which shows a mostly flat top with a small dip in the production curve). Fig. 3: Energy3D results for four seasons. Anyone can easily confirm this effect with an Energy3D simulation. Figure 3 shows the results predicted by Energy3D for 1/22, 4/22, 7/22, and 10/22, which reveal a small dip in April, significant dips in January and October, and no dip at all in July. How do we make sense of these results? Fig. 4: Change of incident sunbeam angle on 1/22 (HSAT). One of the most important factors that affect the output of solar panels, regardless of whether or not they turn to follow the sun, is the angle of incidence of sunlight (the angle between the direction of the incident solar rays and the normal vector of the solar panel surface). The smaller this angle is, the more energy the solar panel receives (if everything else is the same). 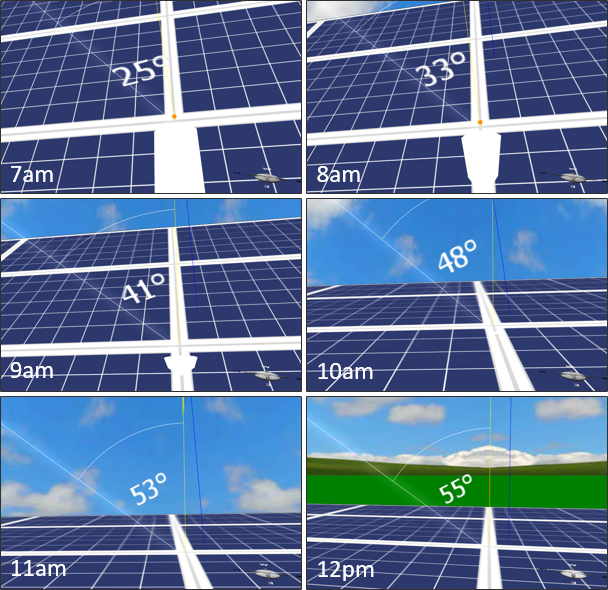 If we track the change of the angle of incidence over time for a solar panel rotated by HSAT on January 22, we can see that the angle is actually the smallest in early morning and gradually increases to the maximum at noon (Figure 4). 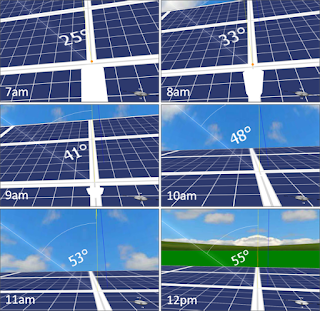 This is opposite to the behavior of the change of the angle of incidence on a horizontally-fixed solar panel, which shows that the angle is the largest in early morning and gradually decreases to the minimum at noon (Figure 5). The behavior shown in Figure 5 is exactly the reason why we feel the solar radiation is the most intense at noon. 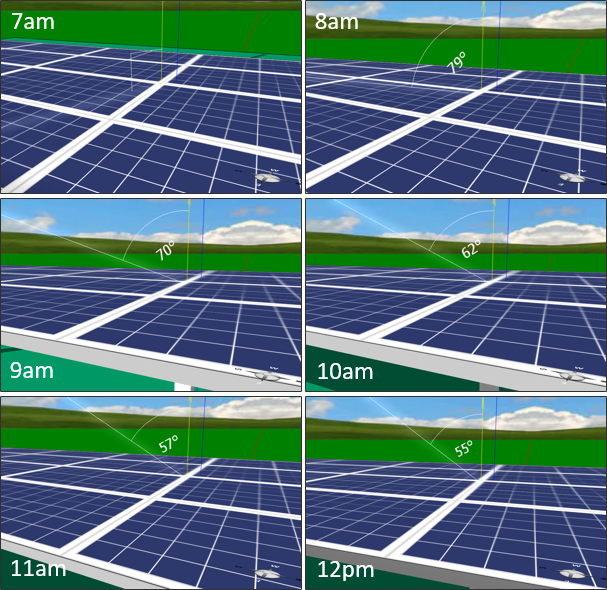 If the incident angle of sunlight is the smallest at 7 am in the morning of January 22, as shown in Figure 4, why is the output of the solar panels at 7 am less than that at 9 am, as shown in Figure 3? This has to do with something called air mass, a convenient term used in solar engineering to represent the distance that sunlight has to travel through the Earth's atmosphere before it reaches a solar panel as a ratio relative to the distance when the sun is exactly vertically upwards (i.e. at the zenith). The larger the air mass is, the longer the distance sunlight has to travel and the more it is absorbed or scattered by air molecules. The air mass coefficient is approximately inversely proportional to the cosine of the zenith angle, meaning that it is largest when the sun just rises from the horizon and the smallest when the sun is at the zenith. Because of the effect of air mass, the energy received by a solar panel will not be the highest at dawn. The exact time of the output peak depends on how the contributions from the incidental angle and the air mass -- among other factors -- are, relatively to one another. So we can conclude that it is largely the motion of the solar panels driven by HSAT that is responsible for this "surprise." The constraint of the north-south alignment of the solar panel arrays makes it more difficult for them to face the sun, which appears to be shining more from the south at noon in the winter. 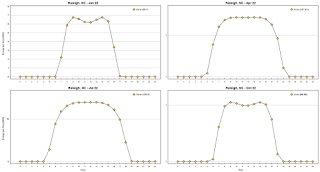 If you want to experiment further, you can try to track the changes of the incident angle in different seasons. 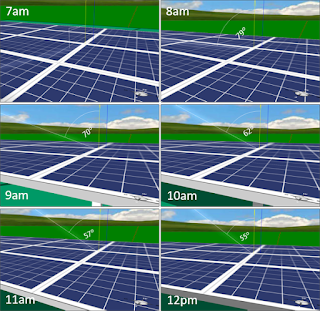 You should find that the change of angle from morning to noon will not change as much as the day moves to the summer. This dip effect becomes less and less significant if we move closer and closer to the equator. You can confirm that the effect vanishes in Singapore, which has a latitude of one degree. The lesson learned from this study is that the return of investment in HSAT is better at lower latitudes than at higher latitudes. This is probably why we see solar panel arrays in the north are typically fixed and tilted to face the south. The analysis in this article should be applicable to parabolic troughs, which follow the sun in a similar way to HSAT.